A £120m project to build or refurbish 10 Aberdeen schools is being funded by money from a collapsed Icelandic bank, it has emerged. 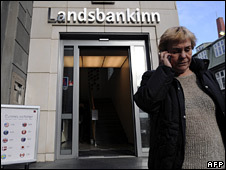 The Icelandic government seized control of Landsbanki earlier this week. Seven other Scottish councils have confirmed they have money on deposit with banks in Iceland. The Scottish Government has called on the Treasury to bail out local authorities affected by the collapse of Iceland's financial system. Finance Secretary John Swinney has written to Chancellor Alistair Darling asking for reassurance that council deposits would be safeguarded by the UK Government. A spokesman for the Treasury said that in Scotland any such assistance should come from Holyrood as local authority matters were devolved to the Scottish Parliament. But a Scottish Government spokesman said that while local authority funding was devolved, financial regulation was a reserved matter and therefore it was up to the chancellor to act. It has emerged that Aberdeen City Council signed a public private partnership agreement with a consortium in February. The deal involved the consortium designing, building, financing and operating the schools over 30 years. Under the project, two new secondaries and seven new primaries will be built, with another primary being refurbished. South Lanarkshire has £7.5m with Landsbanki and its UK subsidiary Heritable. A spokesman for the council said it had asked the Treasury for an assurance over the safety of its deposits. He added: "The council makes it clear that the situation will have no effect on the delivery of its day-to-day services or on the council tax." Councillor Kevin Stewart, the city council's resources management convener, said: "The Landsbanki situation is an unfortunate example of how the current global banking crisis can affect us all. "We see in the news what governments around the world are doing to bring stability back to the financial sector - but at a local level the council is doing everything it can to minimise the impact." South Ayrshire Council has invested £5m in Landsbanki which the authority said was due due to be returned in stages over the next two months. Its chief executive, David Anderson, said: "We will continue to monitor the position and will continue to seek advice from our treasury advisers." North Ayrshire Council revealed a £15m investment in two Icelandic banks - £5m in Landsbanki, and £10m in Glitner. A spokesman said it was looking for support from national government. Scottish Borders Council has £10m invested in Icelandic banks - £5m with Landisbanki and £5m with Heritable. East Ayrshire Council has identified a potential exposure of between £3m-£5m, while Moray Council had £2m in Landsbanki and Perth and Kinross had £1m with the Glitnir Bank. The local government umbrella body, Cosla, said the sums involved were considerably less than those deposited by English councils - which has now risen to more than £600m. A spokesman said it was monitoring the situation.